As mentioned on the BIB on 28 Sept., the Special Consensus (USA) are at present warming up on the Continent, in preparation for their tour of these islands from 17 Jan. to 11 Feb. 2019. 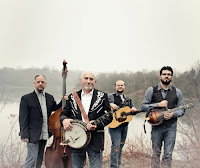 The first instalment of their account of the current tour, covering dates in the Netherlands and Germany, appeared on Bluegrass Today on Friday, and at the bottom there's a link to a glowing account on Banjo Hangout of a show they played in Germany to benefit a church - together with several similarly warm commendations of the band. See also their Facebook. No details yet of the coming tour in Ireland, but the BIB will publish them as soon as they're received. Update 26 Oct.: The second report from the Special C. in Europe can be read here.